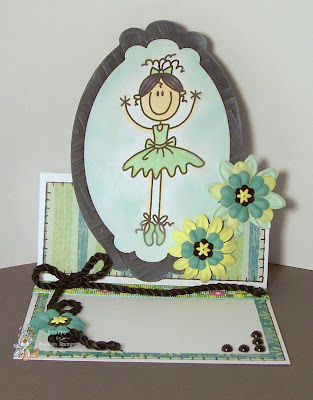 My Easel Card features a digi from the AKV - Ballerina line at Bugaboo Stamps. I had a blast stacking chipboard, paper, plastic & metal flowers for embellies on my card! I hope you like it! Be sure to check out this and all of the other fab digis in the Bug Shop! Don't forget! The Fun Folds challenge is still open over at Catch the Bug too!! Why not head over there and play along? *Use makeup 'wedges' for applying chalk inks - they are cheaper if you buy them in bulk too! love the layout of this Scrappy! this is adorable! fabulous job! Lovely lickle card - super sewing. Thank you for coming over to play at Top Tip Tuesday this week! very cute scrappy, it's a perfect card for a child. thanks for playing with us at Paper Pretties. What a beautiful card Scrappy ! Love those colours ! What a pretty card, cute image and I really like your bow with yarn. Thanks for joining in at PCC this week. So cute. I LOVE how you added the ribbon. Ah isn't she cute! Such a lovely image! Thanks for joining us at Etsy, there's no stopping you this week! Thanks for joining the Pretty challenge at the One Stitch at a Time Birthday Bash. Thanks for joining us in the Plastic Spotlight at Crafty Cardmakers. Lovely soft shades, and a really cheerful card. Thanks for joining in with our plastic spotlight at Crafty Cardmakers. Lovely card, thanks for sharing at Paper Cupcakes this week. Love it! it kind of reminds me of one of those jewelry boxes with the ballerina in it! super cute! Thanks for playing this weeks Stampin' Royalty Challenge! Great card. Thank you for joining The Pixie Cottage Challenge. Love the tent topper card. Super sweet. Thanks for joining us this week at Stampin' Royalty. I like the textures, depth & the way this card stands up. This would be a really special card for someone to receive.